Pressure on Crown Resorts has grown as a new wave of evidence shows that the casino operator might have only stopped what it previously described as a “trial” of removing betting options on slot machines after complaints from patrons. A whistle-blower has told local news outlet ABC News that the major company, which operates two casino resorts in Melbourne and Perth and is building a third one in Sydney, felt forced to restore the normal operations of slot machines at its Melbourne property after customers at the casino had spotted that their betting options had been reduced significantly and had filed complaints. Last fall, the Australian casino operator found itself embroiled in a scandal that could cost it its license in the state of Victoria. Back in October, independent MP Andrew Wilkie tabled evidence from three whistle-blowers who claimed that Crown had tampered with 17 of all 2,628 slot machines (or pokies as they are known in Australia) at its Melbourne casino, significantly reducing patrons’ wagering options and chances to win. The chief allegation against the operator was that it has instructed staff to remove certain buttons on 17 slot machines. The gaming devices had thus been modified in a manner that had maximized profits for the casino and had reduced players’ wagering options. Patrons had thus been forced to wager the highest bet line on the affected machines, whistle-blowers had explained. Separate allegations by the unnamed individuals also suggested that Crown had knowingly allowed select casino customers to dodge anti-money laundering regulations. 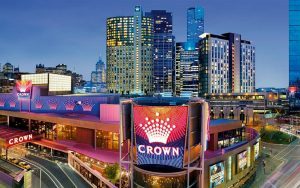 Crown rejected all allegations back in October, but eventually admitted to removing buttons on 17 gaming machines between March and April 2017. The operator said in a March 5 statement to the Australian Stock Exchange that the “blanking” of buttons was part of a trial it had conducted at its Melbourne casino. However, a whistle-blower who is employed at the casino company told ABC that the trial claims were “farcical”. He further pointed out that Crown only came up with the trial story after regulatory pressure began bearing down on its profitability and general performance. The unnamed Crown employee went on to say that no trial had been running on the casino floor and what the operator had basically tried to do had been to see how much it could “rip people off”. Victorian Commission for Gambling and Liquor Regulation had opened investigation into the allegations even before those were tabled in the Parliament. Crown could have its license from the regulator revoked if the allegations prove true. The Commission has been presented with the latest whistle-blower evidence. The regulatory body told ABC that it is aware of the new claims and that these are now part of the ongoing investigation.